A CT scan is a type of x-ray. It uses a computer to make pictures of the inside of the body. In this case, images of the abdomen are taken. Sometimes a chemical called contrast is used to help improve the pictures. Complications with contrast are rare but some people can have an allergic reaction or kidney problems . A CT scan does use radiation. You and your doctor will weigh the harms and benefits of this test. A CT scan may not be advised if you are pregnant. Be sure to discuss these risks with your doctor before the test. Avoid eating or drinking anything for 4 hours before the test if contrast will be used. Remove any metal objects, such as jewelry, hearing aids, or dentures. Sometimes contrast is necessary. It helps make certain organs and tissue easier to see. It is often given by mouth in a drink. Other times, it will be injected into a vein. Occasionally, it is delivered by an enema. You will be positioned on a special moving table. The table will move slowly through the CT scanner. You will need to stay still during the entire test. As the scanner takes pictures, you will hear humming and clicking. The technician will ask you to hold your breath at certain points. This will help get a clear picture. You will be able to talk to the technician through an intercom. If you had contrast, you may be told to drink extra fluid. This will flush the contrast from your body. You may feel flushed if you received contrast. You may notice a salty or metallic taste in your mouth. You may also feel nauseated. The CT images will be sent to a radiologist who will analyze them. Your doctor will receive the results and discuss them with you. Computed tomography (CT)—abdomen and pelvis. Radiology Info—Radiological Society of North America website. Available at: https://www.radiologyinfo.org/en/info.cfm?pg=abdominct. Updated June 16, 2016. Accessed April 3, 2018. Positron emission tomography—computed tomograpy (PET/CT). Radiology Info—Radiological Society of North America website. Available at: https://www.radiologyinfo.org/en/info.cfm?pg=PET. Updated January 23, 2017. Accessed April 3, 2018. Rydberg J, Buckwalter KA, Caldemeyer KD, et al. 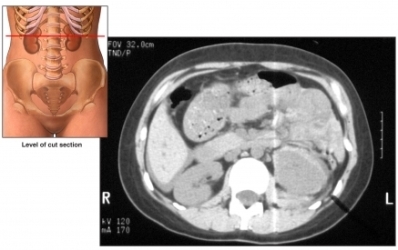 Multisection CT: scanning techniques and clinical applications. Radiographics. 2000;20(6):1787-1806.